Singer & Co. was formed in Coventry in 1875 by Messrs George and James Singer, as a bicycle manufacturer. The Company started making motorcycles in 1901, and its first motor cars appeared in 1905, and by 1928, the company was third to Austin and Morris in British car production. Singer became part of the Rootes Group in 1956, and the name continued to be used for 'badge engineered' versions of other Group cars until 1970. 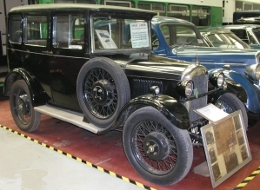 The 'Junior' model was produced from 1927 to 1935. A 1930 advert can be seen here (Grace's Guide website) showing the price of the saloon model as £ 160. This car has an 848cc overhead camshaft engine, 3 speed crash gearbox and cable brakes, it was presented to the LVVS by Youngs Garage of Lincoln.